What is a Spiral Balance? Not all aluminum windows are the same. 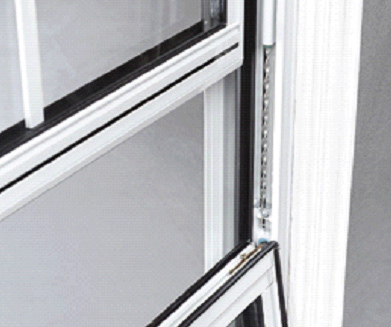 Windows with sashes that lift require hardware that is engineered to carry the “counter-balanced” weight against gravity, much like an elevator. Very old windows were typically wood and they used “block and tackle” systems that were heavy lead weights hidden behind the frames (jambs) and connected by a rope via pulleys to the sash. With growing concerns over lead exposure, and as wood rotted and ropes decayed, designers sought better window systems. Among these are aluminum thermally broken windows with spiral balancers, arguably the most creative balance system ever designed for windows. Essentially, a spiral rod of hardened stainless steel is fitted inside a tube to an awl and wound under significant pressure to store the energy necessary to lift the weight of the sash. The 3/8” or 5/8” tube that houses the tensioned spiral rod is attached to the inside of the jambs, for easy access to adjust or replace if necessary. This unedited photograph also reveals the interlock, balance shoe, pivot bar, double weather stripping, and inside metal glazing bead.